Home :: Why The Silver Tuxedo Considered The Best Apparel Option For The Promenade Occasions? Why The Silver Tuxedo Considered The Best Apparel Option For The Promenade Occasions? Mensusa https://www.mensusa.com/articles/silver-tuxedo-the-best-option-for-the-promenade-occasions.html Why The Silver Tuxedo Considered The Best Apparel Option For The Promenade Occasions? 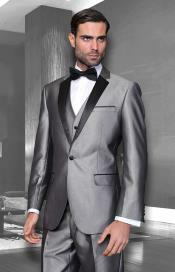 The delightful and ravishing appearance of the silver tuxedo makes the fashionable men go weak on their knees. These tuxedos are the best choice of apparels for the promenade occasions and special events. The colors of the apparels add a certain spirit and theme to the apparels. Hence, the fashion experts always advocate giving good consideration to the choice of the colors. Carefully chosen colors can accentuate the appearance of the wearer, while, on the other hand, mistakes can completely ruin the look. When it comes to the promenade occasion dressing, the silver tuxedo suits are indeed the most delightful choice as apparels. The silver shade projects class and elegance that in a combination of the fashionable appearance of the tuxedos, give the apparels a polished and high-fashioned appearance, capable of accentuating the personality of the wearer in gracious style. The silver tuxedo suit combines sophistication & elegance as in the silver shades with the sleek & smart design of the tuxedos. Hence, it turns obvious that these apparels will get the wearer a polished, fashionable and appealing appearance, which is the demand of the promenade and special events. These suits will uphold your strong fashion pursuits and display your class and mature sense of fashion and the finest sense of dressing, which will suffice to earn you the attention and subsequently the appreciation of the people, revolving around you. If you desire to make a fashionable appearance, you have to select the shade of the apparels in a style that it complements your skin tone. The silver shade suits on the lighter as well as the deeper skin tones and hence, it is rather a universal option of apparel for the fashionable men, irrespective of their skin tones. The silver shaded tuxedos save the men from having to brainstorm about the choice of the shade for their apparels that will complement their skin tones. 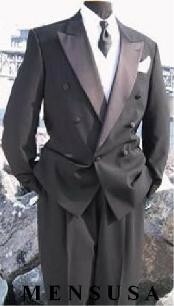 The market is loaded with an inexhaustible option on silver tuxedos, coming in various designs and styling. For example, you have the option to choose between the double-breasted or the single-breasted tuxedos. Similarly, you can either go for the 2-piece or 3-piece tuxedos. Better to say, you get these tuxedos available at the fashion outlets online and it comes for the most nominal price. Hence, you need not overhaul your pockets to get a classy and fashionable silver tuxedo suit. Just, shop wisely and be assured that the investment on these classy apparels will not go in vein. www.mensusa.com offers an impressive portfolio of apparels and fashion adornments for men at the most reasonable price. Dealing with this store, you will always get the best grades of fashion products and the delightful customer services that the shop adapts, will give you a candid and memorable shopping experience.